The Republic of the Marshall Islands (RMI) has submitted a paper to the International Maritime Organization (IMO) Intersessional Working Group (ISWG) on the consistent implementa- tion of the 2020 global fuel oil sulphur standard under MARPOL Annex VI. The submission, which was co- sponsored by the Republic of Liberia, the Baltic and International Maritime Council (BIMCO), the International Chamber of Shipping (ICS), the International Association of Dry Cargo Shipowners (INTERCARGO), the International Association of Independent Tanker Owners (INTERTANKO), and the World Shipping Council (WSC), is intended to assist the ISWG in developing guidelines on the implementation of regulation 14.1.3 of MARPOL Annex VI. 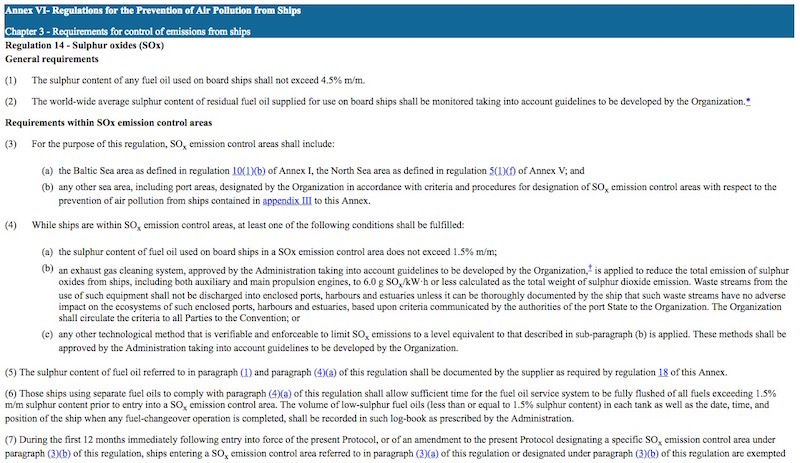 The regulation limits sulphur in fuel oil to 0.50% when operating outside of designated Emission Control Areas (ECAs). It was decided at the 70th session of the IMO Marine Environment Protection Committee (MEPC) to retain 01 January 2020 as the effective date for the shift to the 0.50% global fuel oil standard. The MEPC issued Resolution MEPC.280(70) to affirm this decision. Additionally, recognizing concerns expressed regarding the implementation of this fuel oil standard, MEPC 71 agreed to establish a new output on what additional measures may be developed to promote consistent implementation of the 0.50% global fuel oil standard. The RMI's submission to the IMO provides technical information focusing on safety implications and challenges associated with using new fuel oil blends compliant with the new 0.50% sulphur fuel oil standard. The technical information, detailed in the Annex to the submission, aims to cover a wide range of safety aspects associated with the switch to 2020 fuels such as potential issues with blend components, stability, compatibility and other fuel oil parameters. All of these issues are viewed as having the potential to negatively impact fuel and machinery systems. Accordingly, the technical information also touches upon operational and technical measures to address risks during fuel switching, tank cleaning and fuel system arrangements (heating capacities and tank segregation). The information is intended to facilitate informed decision making as the ISWG addresses preparatory and transitional issues. The co-sponsors also recommend that any consequential regulatory amendments and/or guidelines necessary to address the safety issues raised in the submission are brought to the attention of the MEPC at its next session in October 2018. Likewise, it is also proposed that any potential safety implications resulting from new blends or fuel types should be reported to the next session of the Marine Safety Committee (MSC) in December 2018.